1. Select the Fitness Function cell and specify whether you want this fitness function cell to reach a maximum, minimum, or specific value that you type in the edit box. The cell reference may either be typed in the edit box or highlighted with the mouse on the spreadsheet. 2. Specify which cells need adjustment in order for the Fitness Function cell to reach its goal of a maximum, minimum, or specific value. The user has the option of typing in the range of adjustable cells, using the mouse to highlight the range of adjustable cells, or clicking on the AutoDetect button to have GeneHunter automatically find these cells. 3. Select a problem solving method by selecting a Chromosome Type from the list box. 4. 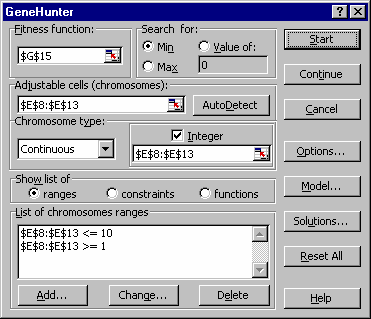 Enter ranges (hard constraints) which limit the values that GeneHunter will search for a solution. (Soft) constraints may be used as a subgoal that GeneHunter considers when searching for an optimum solution.